Warning: The images and all material displayed on this gallery are provided solely for private viewing. The images are protected by copyright laws and cannot be downloaded printed, copied, reproduced republished, manipulated, altered, transmitted or distributed in any way for either personal or commercial use without prior permission of the respective copyright owner. The Forest Department traps many tigers from villages in the fringe of the Sundarban and releases them deep inside the core. 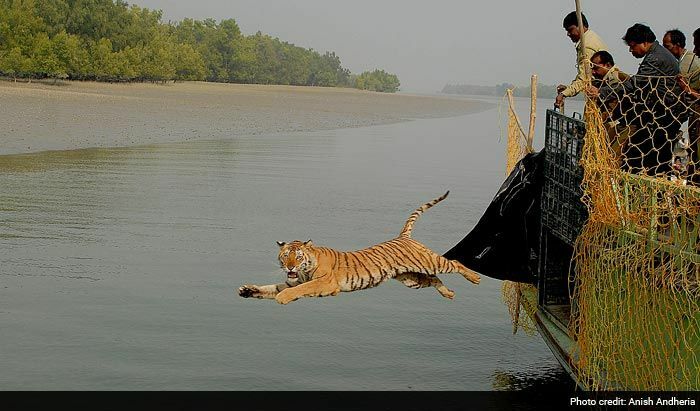 This image captures the exuberance on the face of a tiger as it is released after being tormented by villagers. Man-animal confrontation is one of the biggest threats to wild animals in India.